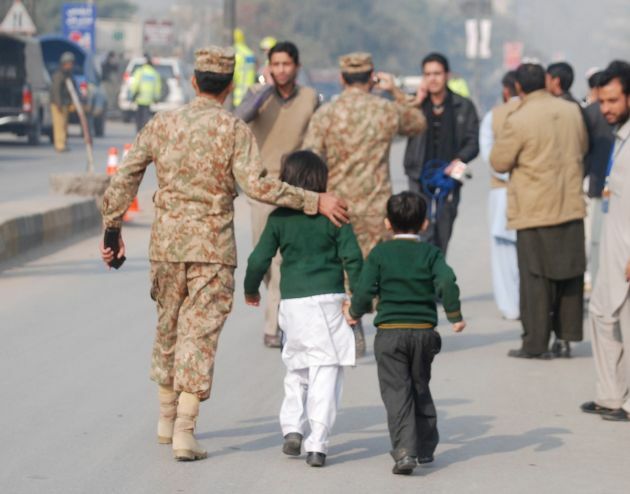 (Photo: REUTERS / Khuram Parvez)A soldier escorts schoolchildren after they were rescued from the Army Public School that is under attack by Taliban gunmen in Peshawar, December 16, 2014. Taliban gunmen in Pakistan took hundreds of students and teachers hostage on Tuesday in a school in the northwestern city of Peshawar, military officials said. More than 100 school pupils were killed along with teachers in the attack. GENEVA - The U.N. human rights chief Zeid Ra'ad Al Hussein has condemned "an utterly despicable and incomprehensibly vicious attack on defenceless children" at a school in the Pakistani city of Peshawar. "The Taliban have sunk to an all-time depth with this attack," United Nations High Commissioner for Human Rights Zeid said December 16 after the attack on the co-educational school. At least 132 students and nine staff members were killed Tuesday after Taliban gunmen broke into a school in Peshawar and opened fire, witnesses said, in the bloodiest massacre the country has seen for years, Reuters news agency reported. United Nation Secretary-General Ban Ki-moon later strongly condemned the "blood-curdling attack" from New York. "It is an act of horror and rank cowardice to attack defenseless children while they learn," Ban said ahead of an address to the Security Council on regional cooperation. "The hearts of the world go out to the parents and families who lost loved one in the horrific attack." Ban said, "Getting an education is every child's right. Going to school should not have to be an act of bravery." In Geneva, the U.N. human rights chief, a former Jordanian diplomat said, "Everyone must now unite to combat this type of savage extremism." The Taliban, which is waging war against Pakistan to topple the government and set up an Islamic State, immediately claimed responsibility. "No government or intelligence agencies, no religious figures, no wealthy sponsors, no members of the general public can possibly justify continuing support for the Taliban, ISIL, Boko Haram, Al Qaida or any of these takfiri groups which appear to be competing to attain the highest level of human barbarity," lamented Zeid. Wounded children taken to nearby hospitals told Reuters most victims died when gunmen with suicide vests strapped to their bodies, entered the compound and opened fire indiscriminately on boys, girls and their teachers. "We must all join together to counter such extremism and violence – not only in Pakistan, but anywhere where children's rights and human rights are attacked in this way," said Zeid in his statement. Zeid said, "In parts of Pakistan, Afghanistan and Nigeria simply showing up at school takes tremendous courage and determination." He said the his staff have in recent years received increasing frequent reports in these three countries of schools destroyed or closed because of militants' threats, and of schoolchildren. Girls especially girls are "being kidnapped, shot, attacked with acid or poisoned by groups whose ideology bears no resemblance to any religion or any cultural norm," said Zeid. The High Commissioner noted the powerful statement by Pakistani teen Malala, herself the victim of such an attack by the Taliban in Swat, which lies to the north of Peshawar, when she received her Nobel Prize last week. Malala said she wished her generation would be "the last that sees empty class rooms, lost childhoods and wasted potentials," and noted that despite her celebrity her home village does not yet have a secondary school for girls. During the Taliban occupation of Swat from 2007 to 2009, several hundred schools were closed or destroyed.